I added to this gradually through Monday and Tuesday. It's not so much about David Bowie's passing as about people's responses to me on on those two days. I was blurry-eyed and wanted to come to the computer so I could read better, and respond. The first thing I saw was someone having posted "Just learned that Sandra was officially Bowie's first US fan heart emoticon Still shocked at the thought of him gone." "Sad times, figured you should see it here before some less tasteful page announces the news: http://www.bbc.com/news/entertainment-arts-35278872"
It linked to a BBC news announcement. Fifteen minutes later, Melissa Chan called me from TIME magazine and spoke with me for quite a long time. Then we had an e-mail exchange. They already had an article up, and it hadn't been updated with anything from me when I looked at 7:45. The title of the article is lame (David Bowie’s Letter to 14-Year-Old Fan Resurfaces After Singer’s Death), and it wasn't a gift from my uncle. It was a reject from the station for being rock'n'roll and not country. My uncle used to give my cousin, Debbie, all the rock albums. Debbie went through a pile and took what she wanted, and brought the rest to give to Nada, when she stayed with us that summer of 1967. Nada went through the pile, took what she wanted, and gave me the rest. So it was rejected three times before I got it. The letter didn't "resurface," as it was never lost. This interview of Sandra for the Daily Star yesterday is really lovely. Two young people connecting so sweetly, and then both going on to inspire so many in their different fields. It took the edge off yesterday a bit to read and share this wonderful story. Very sweet story of letter exchange between Bowie and a then young girl whose own life and writing would inspire many to take off-road adventures. Except for a couple of times when I sound more British than I could ever be, I think it's wonderfully well done. I might transcribe that whole interview and article, from that paper, when I get a chance. The scans aren't easy to read. Thought of you this morning when I learned of David Bowie's passing. I think of you often- at least from time to time- usually it's some nugget of wisdom that has changed the way we 'family'... blessed & changed the way i parent: i am a more fun, more thoughtful, more responsible mama thanks to the ways your work has touched my life... hmmn. ANYway... funny how the mind works & what brings someone to mind. This morning I think of you. And Mr. Bowie. With heartfelt thanks & much Honor to you both for the contributions you have made to my life. To so many lives. Thanks Both. Like many today, I've shared your "letter of note" from David Bowie. Thank you for sharing your letter with the world. It's an incredible glimpse that only you could give us. I'm so glad you saved it. It seems obvious to me, now, that you would write his first American fan letter and he would respond in length and with much cleverness, to you. Two originals brought together through music. Very apropos. Some of what I'm going to add here I will have cut and pasted from comments on facebook or messages, so I don't have to write it again. Although one article says so, the letter did NOT make me "the envy of my friends" because they had never heard of David Bowie. I told a TIME magazine reporter this morning something I hadn't thought of so clearly before. I had the opportunity to listen to that album without any prior knowledge of him. Few others in the world, ever, had that chance. When he was filming The Man who Fell to Earth in Madrid, New Mexico, a friend of mine said "Isn't that they guy who wrote to you?" Yes, I said. The friend was really pressing me to GO there to the film site and introduce myself. I said no. I had no interest. Others have asked since, but I had already written what I had wanted to say to him. I wasn't being giddy fan-girl. I had been impressed by his songs, and by his writing, and I had already communicated that and he had been generous to share that packet of stuff with me. I didn't want to invade his privacy, and film sets don't let just anyone on. The friend said "Take the letter, and they'll let you in." Really, I didn't want to do that. There was another time, when the letter was published in Letters of Note, that someone from New York City contacted me insistently, that I should meet up with David Bowie and if I wanted to, he could arrange it. I politely declined. He was insistent, nearly to the point of being insulting. I said I had no interest in invading anyone's privacy. Probably this agent-of-meeting guy was hoping for the excuse to meet David Bowie himself. I didn't want to assist anyone else to bother him, either. Second half of the day, waiting to be interviewed for KOAT TV. Lida Alikhani called, late morning, and will come here. Got a call from Meredith Dunkel with a request for a radio interview tomorrow/Tuesday morning on 99.5 Magic FM (Albuquerque). Meredith says she'll try to send me a copy, and it's okay for me to put it on my site if so. That is so freaking cool! Who could have known how big of a star he'd go on to become but she liked him then for who he was then. 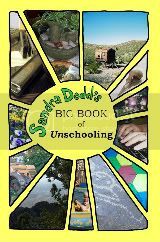 Sandra Dodd has had a profound and hugely positive impact on my life, especially when I experienced my first wobbly steps into the world of homeschooling, and more importantly, Unschooling. And once again she humbly shows how she is a woman far ahead of her time. As I said, you never cease to amaze me! I didn't keep the names with these quotes, because I didn't have time on Monday to ask anyone for permission (nor to eat). How fitting that Sandra Dodd was David Bowie's first American fan; no one could have known it at the time, but this is a letter from one groundbreaking pioneer to another. This morning I drove do KOB's studio to do an interview for NBC London, but it will be on in Albuquerque tonight, and I don't know where all else where NBC stories are shared. I have a request to participate in a podcast on New Mexico doings, in a couple of weeks. Very exciting! How cool something you did as a teen would have reverberations today. That article is a bit irritating. Why would I be "the envy of my friends"? He was totally unknown. Both my cousins had rejected the album, from a pile of demos from my uncles C&W station. Joyce Fetteroll wrote (I have the note in that collection now) that now my letter had fans. I think I will end this narrative on Tuesday night. It has been a part of the celebration of the life of David Bowie—a focus on one incident in his youthful pre-fame. I'm happy to have received, and saved, that beautiful letter.